Shortly before Christmas I wrote the following letter to Mr. Sergej Glaziev, one of Russia’s top economists and economic advisor to President Putin. Sergej is also a member of the Greek Delphi Initiative. As Professor Michel Chossudovsky so aptly writes, western corporatism is waging an economic war against the world accompanied by increased militarism carried out mainly by the Pentagon and its minion European allies, NATO. Stopping this criminal western imposed economic supremacy, all based on dollar fiat money, controlled by FED, Wall Street and the Basle (Switzerland) based BIS (Bank for International Settlements), also called the central bank of the world’s central banks, must be the world’s Priority Number One. The BIS was created in 1930 with the objective to help with the settlements of loans related to the reparation payments by Germany after WWI. It later took over the role of coordinating and gradually controlling central banks around the world and the flow of funds between them. 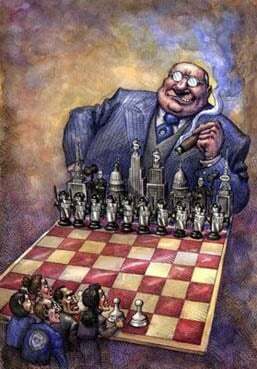 The Rothschild – Rockefeller families were instrumental in setting up the institution and are still today among the major shareholders of an entirely privately owned international monetary institution. The BIS is one of the most secretive and obscure institutions in the world that helped the FED finance Hitler’s war against Russia during WWII. Yes, for those who don’t know, Washington had already then talked and walked with a forked tongue, playing both sides, as they do now with ISIS. But despite this satanical act – which the failing empire is repeating at nauseatum around the globe, killing millions – the Soviet Army defeated the Nazis, as my friend Andre Vltchek so eloquently says in his latest piece comparing Syria with Stalingrad, no matter how cowardly Washington’s deceit, Russia will not be defeated, nor will Syria, nor will China – nor will the world that loves freedom. People who love cannot be defeated. The western immoral, nefarious monetary system forces starving people to death by sanctions, by IMF strangulations, by creating unemployment through corporate privatization of public and social services, by greed – is bound to provoke revolutions, perhaps slowly, but surely. That’s why militarization has to go hand in hand with economic warfare, so that any potential public upheaval can be oppressed by bloody military and police violence before it can rise. Economy through the prevailing monetary system is used as a deadly weapon, as deadly as bombs and canons. Beating the economy of war with an economy of peace, may be one way of conquering and subduing Humanity’s Enemy Number One – the Anglo-Zionist Empire with seat in Washington – and its spineless lackeys in Europe – who seamlessly after self-provoked and instigated terror attacks in France, Lebanon, Egypt, Mali – to name just a few – and fabricated terror warnings throughout Europe, now also in Munich, are terrorizing the European people into literally asking for a military clamp-down – ‘please protect us – we gladly give up all our civil liberties’. This has already happened in the US, where the American people have lost 90% of their civil rights since 9/11 through the Patriot Act and varies subsequent iterations of it. The US today is nothing but a militarized police state. In no time Europe will be the same. These thoughts have prompted me to write to Sergej Glaziev, a brilliant economist and fellow-member of the Greek Delphi Initiative. The Delphi Initiative is an inspirational and internationalized movement of thoughts launched in June 2015 by a group of Greek intellectuals to seek alternatives to the troika (ECB, EC, IMF) caused Greek breakdown, to the US-NATO sponsored Ukrainian civil war and to seek an independent Europe of solidarity. Please allow me to write to you with one simple but monumental concern: The survival of humanity. Washington follows a foreign policy of constant provocation for constant conflict. It is a monster with more than 1,000 military bases around the world, spanning its tentacles into every region of the globe, creating friction, for conflicts, for military interventions, for ‘regime change’. Six Anglo-Saxon Zionist-dominated giant media corporations are controlling 90% of the ‘news’ consumed by the West. They spit out endless lies, double-talk, hypocrisy, manipulating public opinion seeking consent for the empire’s evil interventions in sovereign nations’ internal affairs. For the media’s propaganda and mind control campaigns no cost is too high. Why should it? – Fiat money is produced at a mouse click in the billions if necessary to manipulate public opinion into voting for neoliberal candidates in so-called ‘democratic elections’, from Greece, to Argentina to Venezuela to Spain and all over the ‘western’ world, including Japan and Australia. It would be against all odds that a majority of people who suffered for years under drastic austerity measures imposed by their neoliberal governments, would out of free will vote again for their hangmen. It is hardly coincidence that in Europe, not one out of the 28 EU members has a left-leaning government. The illusion that Europe could become at least an economic counter-force has vanished long ago. Europe, the harbinger of hundreds of years of atrocious and murderous colonization of Africa, Asia and the Americas is hardly the ethical and moral power to resist the new neoliberal Anglo-Zionist empire with headquarters in Washington. The so-called European Union and even non-EU members have long ago conceded most of their national sovereignty to Washington. The EU, with the US behind its creation, was never conceived to become a political union. In such a scenario, a common currency, the Euro, was and is a sham. Lack of EU solidarity was exemplarily demonstrated in Greece. The EC, folded into the US (Wall Street, IMF) dominated troika, ruthlessly demolished Syriza. The concepts of ethics and solidarity do not exist in the EU, certainly no more than in the self-proclaimed hegemon of the world. Their blackmailing Greece into submission is a criminal act by any international standards of law – if there was still a court that would uphold such standards. It is fundamental to unequivocally understand that the United States has one goal – and one goal only – seeking global military, financial and economic hegemony; or as Washington’s strategists call it, Full Spectrum Dominance. There is NOTHING, no diplomacy, no negotiation that could detract them from their course. Peace is not in Washington’s cards – and has not been for the last 200 years. The objective to reach absolute power was set latest at the onset of WWI; it was intensified in the lead-up to WWII, when the FED via Wall Street and the BIS (Bank for International Settlement), conveniently located in Basle, Switzerland, bordering Germany, financed Hitler’s war against the Soviet Union. The objective for absolute power was eventually solidified with the Pax Americana, later converted into the PNAC (Plan for a New American Century), written during the artificially created Cold War, by Zionist-led Washington ‘think tanks’ (sic). Today more than 50% of the US GDP is generated by America’s war machine and related industries and services. US/ NATO instigated conflicts, wars and proxy or mercenary wars in the last 15 years have left behind a death toll of 10 to 12 million people; and a chaos of destruction and misery contributing a considerable portion of refugees to the worldwide flood of at least 60 million refugees (UNHCR), seeking shelter, food and security in the very nations that destroyed their economies, homes and families. While the dollar monetary system commands the (western) world, one of the three key instruments of oppression and dominance (the other two being war and propaganda), the death toll and destruction will further proliferate – unless – UNLESS, the monster is forcefully stopped in its tracks. No matter what diplomatic efforts Russia and China may make, no matter what concessions the US and its European and Gulf State minions may appear to make – the PNAC’s objective of Full Spectrum Dominance will not change. Why do I tell you this? – Most, if not all, you probably already know. Thanks to the wisdom of Mr. Putin and his team, the world has so far been saved from a WWIII scenario. Mr. Putin’s speech on 28 September at the UN General Assembly and Russia’s subsequent, fully legitimate intervention in Syria to fight the Western terror creation ISIS / Daesh, has started making a dent in the world’s public opinion. There is some awakening taking place. The tectonic plates may have started shifting. At the same time however, Washington is upping the ante, by intensifying its aggression and provocations around the world. There is no doubt that the Russia-China force-de-frappe is superior to that of the US and NATO. The concern is bloodshed, and possibly annihilation of mankind. My credo from one economist to another – There is another, possibly bloodless way to conquer the monster: economics. reducing dollar reserve holding below the 50% mark, by encouraging the Chinese Yuan – now officially admitted in the IMF’s SDR basket – as viable alternative reserve currency. Reducing demand for the fiat dollar, and offering an alternative international payment system, will break the west’s fraudulent dollar grip on the world’s economy; freeing humanity from criminal ‘sanctions’, currency and commodity manipulations. Once a critical mass is on board the new system, an unstoppable sea-change may take place, breaking the dollar hegemony – and Washington’s path to Full Spectrum Dominance. A dying beast may still attempt to destroy whatever it can find on its way to oblivion, even committing nuclear suicide – in which case I trust in the Russian-Chinese defence tactics and especially in Mr. Putin as the world’s top geopolitical chess player. With my best wishes for the Holidays and most certainly for a more peaceful 2016.